Content marketing is huge right now, but does it work for you? Just writing and writing and writing can work, eventually. However, it’s much better to apply tested and proven methods to your writing. In other words don’t just write instead write copy! I was at a conference recently and I attended a talk by Joost de Valk of Yoast SEO fame. His talk was all about tuning your content with some very easy tips, to make the writing stand out. Of course, his aim was to make you use his Yoast SEO plugin which now offers a feature that point out your errors. I want to teach you these ideas today, with little bit more of an in depth explanation to each, as well as some extra tips for taking your writing to the next level. What Joost was proposing isn’t rocket science, neither is it anything new. That being said, they are easy to implement and will improve your writing. The absolute first thing you need to do is have a structure in place. Having a basic outline, just a list of subheadings for example can help you focus your article. You could also use a list of ideas or topics you want to talk about, so you can see how they flow together. Paragraphs should be short, 2 or 3 sentences is a great paragraph length. Any longer and they become a wall of text. As well, each paragraph should start with an idea. The following sentences should expand upon that idea. As an internet marketer you should know that clear headings are important. When done correctly just reading the clear headings can tell some the story, if in brief. Wordy sentences that go on and on, without really coming to an end that just keep going and don’t really get to the point, all the while going from idea to idea and maybe even changing topic to dogs and how cool they are becomes really annoying to any reader. Keep your sentences short and to the point. If you don’t your readers will quickly become tired of your writing and redo their Google search. Ideally sentences should be 20 words or less. I am terrible at this as I love using a wide vocabulary. If you’re writing prose, using interesting and underused words is great. Using those sort of words for copywriting is a bad idea. Keep your words simple, and ideally with a short syllable count: 3-4 max. I’m not saying you should dumb down content, that’s possible the worst thing you can do. Instead just use words that convey the point clearly and simply. Remove fluffy and filler content and words. Examine the sentence and think, do I really need this word? Can the sentence work without it? This is the hardest thing to remove from your writing, as not everyone even understands what it is. The passive voice is a grammatical construction (specifically, a “voice”). The noun or noun phrase that would be the object of an active sentence (such as Our troops defeated the enemy) appears as the subject of a sentence with passive voice (e.g. The enemy was defeated by our troops). Still confused? Yes, me too. It’s difficult to understand let alone realize you are writing in that “voice”. The best way to understand it is if there is an action then the person (organization, etc.) must do the action. Active: the web developer created the website. 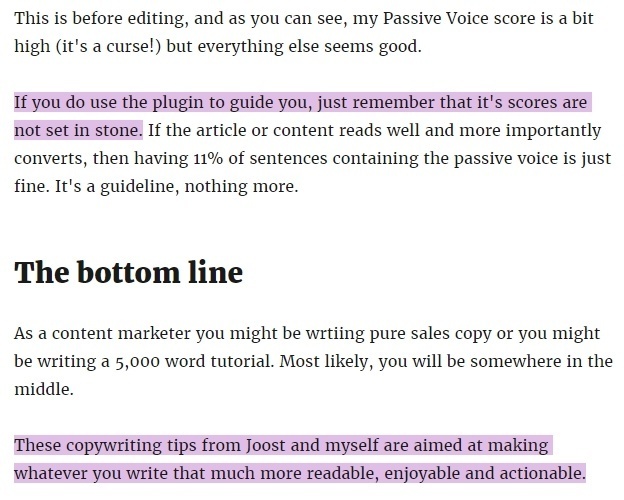 While Joost’s plugin can identify the passive voice, it can’t fix it for you, so you need to have a good understanding of it and that will take a little time to learn. Joost’s talk was really just an advertisement for the new feature with some basic advice to help provide value. That basic advice however is important and a great stepping stone to improving your writing. There are some more tips you can use to create writing that is effective copywriting. Forget that thousands of people can be reading your content. Instead remember that people read your content one at a time. Don’t talk to the audience, talk to that person. This comes across as much more intimate and personal. I started this article with a story about visiting a conference and seeing a talk by Joost. Perhaps it’s not a great story, but it’s still better than nothing. Humanity has used story telling since we could string words together, and it is integral in our psyche. Using a story to get a point across helps to tap into this and makes your content more memorable, because when a story is remembered, so is the moral or point of the story. A weasel word is basically a vague word or turn of phrase. Avoiding Weasel words is essential for sales copy, though in content marketing it can be more of a relaxed. How well did I score? This is before editing, and as you can see, my Passive Voice score is a bit high (it’s a curse!) but everything else seems good. Remember that the scores are a guideline, nothing more. If the article or content reads well and more importantly converts, then having 11% of sentences containing the passive voice is just fine. As a content marketer you might be writing pure sales copy or you might be writing a 5,000 word tutorial. Most likely, you will be somewhere in the middle. These Joost and myself have provided these copy writing tips to help you make whatever you write that much more readable, enjoyable and actionable.